They’ve been through a lot together, have Arthur and Leonard. That’s how it is with Leonard: once you’ve found him, he’s got you for life. It’s the poetry, the man himself, but overwhelmingly the songs. Everybody knows. Arthur Smith knows, and sensibly lets Leonard’s songs work their familiar magic. He’s been coming to the Fringe for the best part of 40 years has Arthur. Next month is Leonard’s 80th birthday. That’s longevity for you. A loyal constituency of fans, who have grown up and grown older with both men, waited patiently in the long queue that snaked round the sold-out venue. The structure of the show sees Arthur interweave stories from his life with Leonard’s songs. He’s in turn clever, interesting, playful, silly, thoughtful and thought provoking. 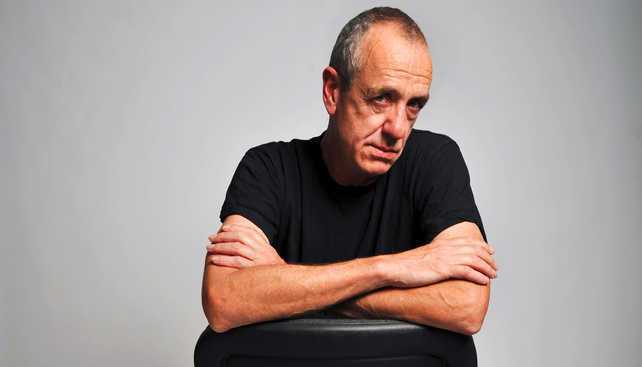 There are laughs, and plenty of them, but you don’t come to see Arthur Smith for laughs alone. There are moments of light and shade, especially as Arthur beautifully and movingly recounts the summer and winter of his mother’s life. It’s a world away from so many other comedians staple of the contrived story stretched beyond belief for our entertainment. Musically, it helps if you know and love the songs of Leonard Cohen. Arthur’s renditions are affectionate and honest tributes to Leonard, and capture something of his hero’s vocal performance and style. Like Cohen, he’s surrounded himself with top musical and vocal talent in the shape of Kirsty Newton, Carrie Marx and Ali Day, aka The Smithereens. Cohen’s lyrics stand out – how could they not? But Arthur knows a thing or two himself about stringing words together. He’s devastatingly funny with a target in his sight. A right he’s earned courtesy of his status as an icon of alternative comedy. Despite a fire alarm disputing the last song, Arthur continued and his audience of loyal fans stayed put to the last note.